Christmas 2011 was a special time in the Tetons. 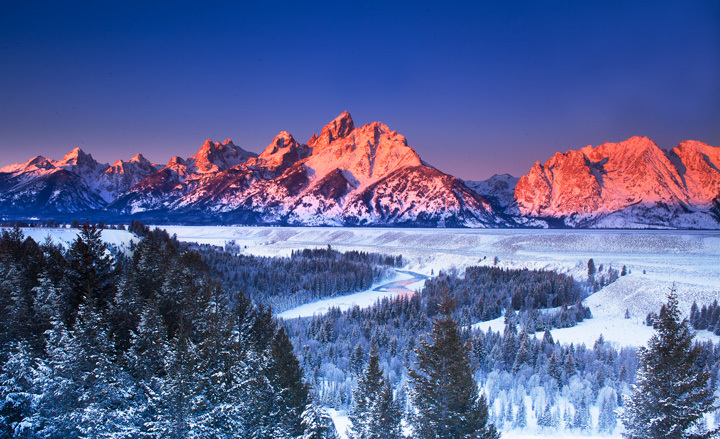 While the snow was nowhere near what it usually is, the frequent clear skies afforded more opportunities to watch that amazing spectacle of the first rays of sunlight turning the Teton peaks into a fiery glow of orange and red. It takes less than 15 minutes for the sun to light the entire mountain range after it strikes the first peak. On Christmas morning, the temperature was 21 degrees below zero with fierce winds. But that magical sunrise was followed by an even rarer treat: wolves running through the snowy fields after a night of hunting in the Gros Ventre river bottom, not far, ironically, from where the Teton park superintendent still strangely permits the hunting of elk. Sunrise bathes the Tetons in warm light. But the sun carries little warmth this December morning. Temperatures are still 18 below. Photo © copyright by Ed Fuhr. Elk congregate on a bitter cold morning on the elk refuge. Photo © copyright by Ed Fuhr. Elk search for food as winter's snows begin to bury the elk refuge. Photo © copyright by Ed Fuhr. 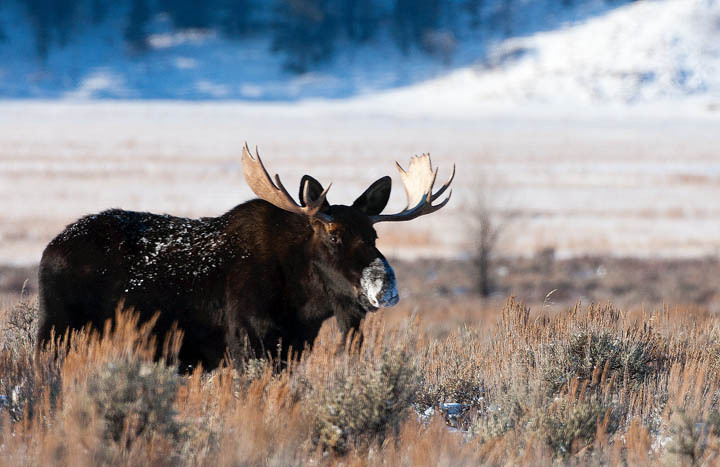 A bull moose pauses before resuming eating on the snowy sage flats of Grand Teton National Park. . Photo © copyright by Ed Fuhr. 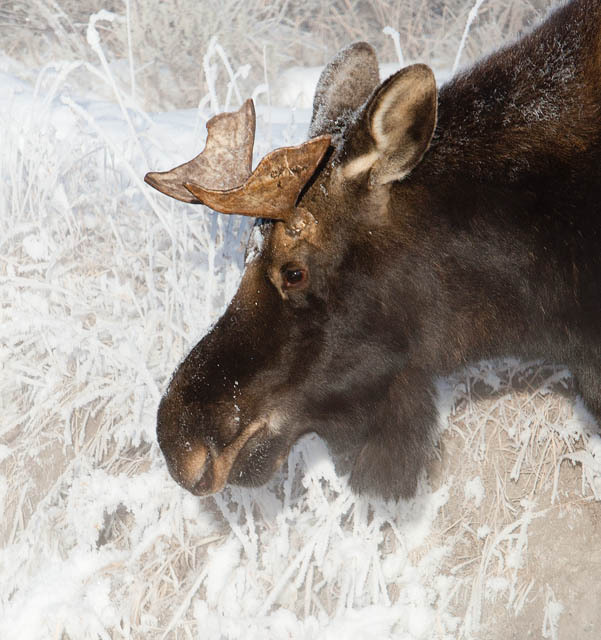 A young bull moose pokes through the snow and frosted grasses to reach the warm springs north of Kelly, Wyoming. Photo © copyright by Ed Fuhr. Fall grasses stand before young willows in the winter snow. Photo © copyright by Ed Fuhr. 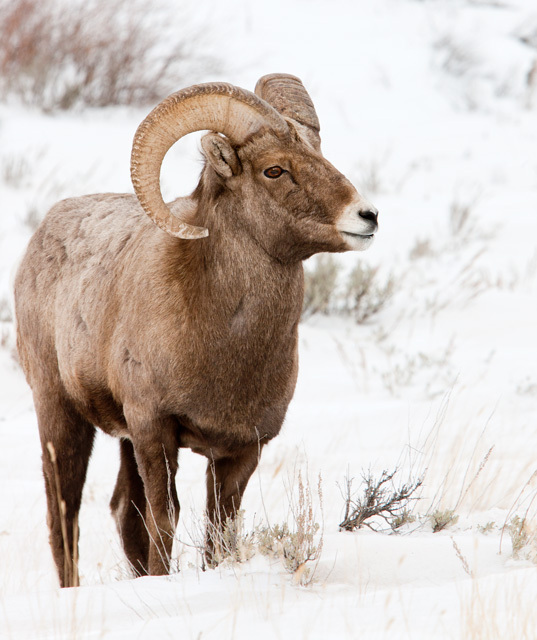 A big horn sheep ponders where to dig for food in winter's snow. . Photo © copyright by Ed Fuhr. The early sun paints Mt. Moran in its brilliant light even as temperatures hover well below zero near the scenic bend in the Snake River. Photo © copyright by Ed Fuhr. 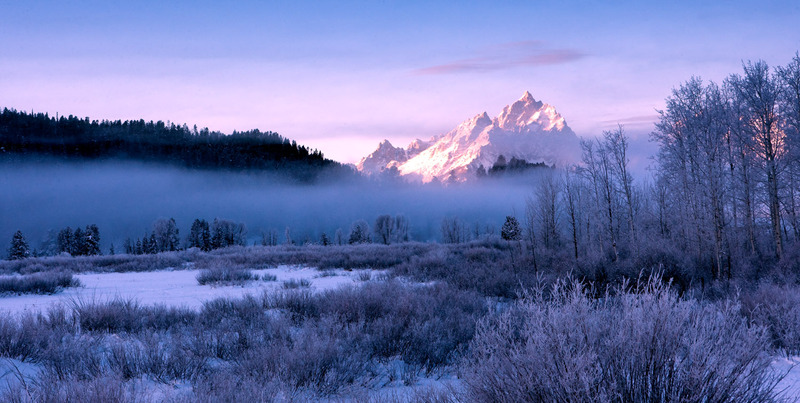 The Teton range peeks above the fog that hovers above the frozen Snake River. Photo © copyright by Ed Fuhr. 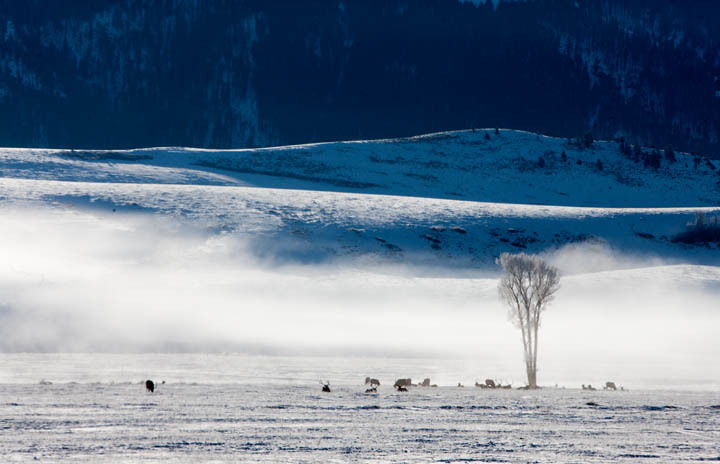 The Teton range glows behind the lifting fog above a frozen Jackson Lake. . Photo © copyright by Ed Fuhr. 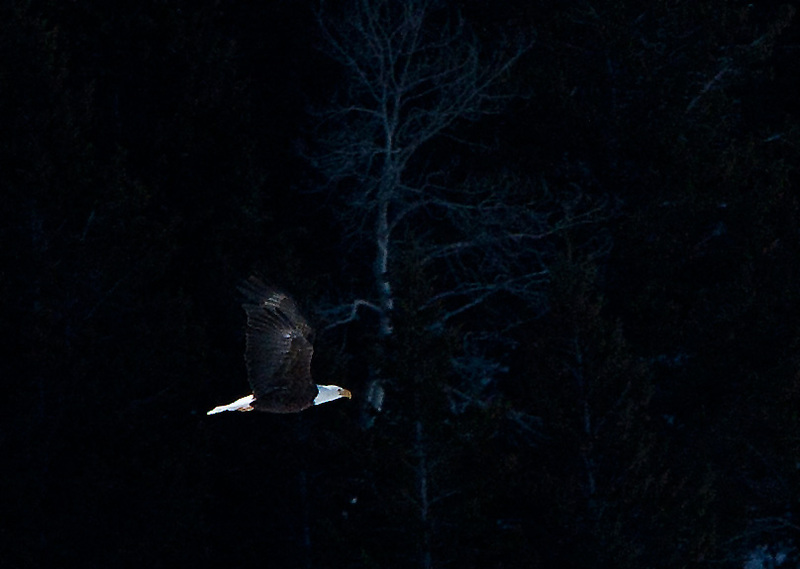 A bald eagle takes flight after being spooked from the elk carcass where it had been feeding. Photo © copyright by Ed Fuhr. Christmas dawn arrives with the skies clear and a temperature 20 degrees below zero. Photo © copyright by Ed Fuhr.